For the big band trombonist and bandleader, see Tommy Dorsey. Thomas Andrew Dorsey (July 1, 1899 – January 23, 1993) was an American musician. Dorsey was known as "the father of black gospel music" and was at one time so closely associated with the field that songs written in the new style were sometimes known as "dorseys". Dorsey was the music director at Pilgrim Baptist Church in Chicago, Illinois, from 1932 until the late–1970s. Dorsey's best-known composition, "Take My Hand, Precious Lord", was performed by Mahalia Jackson and was a favorite of the Rev. Martin Luther King Jr. Another composition, "Peace in the Valley", was a hit for Red Foley in 1951 and has been performed by dozens of other artists, including Albertina Walker (the "Queen of Gospel"), Elvis Presley and Johnny Cash. The Library of Congress added his album Precious Lord: New Recordings of the Great Songs of Thomas A. Dorsey (1973) to the United States National Recording Registry in 2002. Dorsey was born in Villa Rica, Georgia. Earlier in his life he was a leading blues pianist known as Georgia Tom. As formulated by Dorsey, gospel music combines Christian praise with the rhythms of jazz and the blues. His conception also deviates from what had been, to that time, standard hymnal practice by referring explicitly to the self and its relation to faith and God, rather than the individual subsumed into the group by belief. Dorsey's father was a minister and his mother a piano teacher. He learned to play blues piano as a young man. After studying music formally in Chicago, he became an agent for Paramount Records. In 1924, he put together a band for Ma Rainey called the Wild Cats Jazz Band. He started out playing at rent parties under the names Barrelhouse Tom and Texas Tommy, but was also best known as Georgia Tom. For a short time around 1926, he accompanied the Pace Jubilee Singers. As Georgia Tom, he teamed up with Tampa Red (Hudson Whittaker), with whom he recorded the raunchy 1928 ragtime hit record "It's Tight Like That", a sensation, eventually selling seven million copies. In all, he is credited with more than 400 blues and jazz songs. 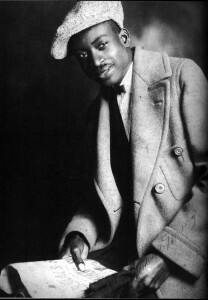 Dorsey began recording gospel music along with blues in the mid-1920s. These recordings led to his performance at the National Baptist Convention in 1930, and he became the bandleader of two churches in the early 1930s. In his grief after the death of his wife Nettie in 1932, Dorsey wrote his most famous song, one of the most famous of all gospel songs, "Precious Lord, Take My Hand." Unhappy with the treatment received at the hands of established publishers, Dorsey founded the first black gospel music publishing company, Dorsey House of Music. He also founded a gospel choir and was a founder and the first president of the National Convention of Gospel Choirs and Choruses. Dorsey influenced not only African-American music but also music by white artists. "Precious Lord" was recorded by Albertina Walker, Elvis Presley, Mahalia Jackson, Aretha Franklin, B. B. King, Clara Ward, Dorothy Norwood, Jim Reeves, Roy Rogers, Tennessee Ernie Ford, and Johnny Cash, among many others. It was a favorite gospel song of the Rev. Martin Luther King, Jr., and was sung at the rally held at Mason Temple the night before his assassination. By his request, it was sung at his funeral by Mahalia Jackson. It was a favorite of President Lyndon B. Johnson, who also requested that it be sung at his funeral. Dorsey was also a great influence on other Chicago-based gospel artists, such as Albertina Walker and the Caravans and Little Joey McClork. Dorsey wrote "Peace in the Valley" for Mahalia Jackson in 1937, which also became a gospel standard. Elvis Presley's rendition of "Peace in the Valley" as delivered on his third appearance on The Ed Sullivan Show, on January 6, 1957, was seen by approximately 50 million television viewers. That night, Presley launched a live emergency appeal to lessen the plight of some 250,000 Hungarian refugees fleeing the recent invasion of their country by the Soviet Union, and dedicated the song to them, those watching sent within the next 11 months, some US$6 million, the equivalent of US$49.5 million in 2017 dollars, the recipient being the International Red Cross in Geneva, which distributed the perishable and nonperishable articles purchased with these funds to the refugees in England and Austria, where they settled for life. Dorsey was a member of the Omega Psi Phi fraternity. Dorsey's niece is Lena McLin, Gospel singer and Chicago-area music teacher. In 1925, Dorsey married his first wife, Nettie Harper. Harper, who had been Ma Rainey's wardrobe mistress, died during childbirth in 1932. Two days later the child, a son, also died. Dorsey died on January 23, 1993 in Chicago, Illinois at age 93. He was interred there in the Oak Woods Cemetery. Dorsey was inducted into the Gospel Music Hall of Fame in 1982. Dorsey was the first African American elected to the Nashville Songwriters Hall of Fame and also the first in the Gospel Music Association's Living Hall of Fame. In 2007, he was inducted as a charter member of the Gennett Records Walk of Fame, in Richmond, Indiana. His papers are preserved at Fisk University. Dorsey's works have proliferated beyond performance, into the hymnals of virtually all American churches and of English-speaking churches worldwide. ^ "Thomas A. Dorsey". Southern Music in America. Retrieved 2014-06-14. ^ Reagon, Bernice Johnson (2001). If You Don't Go, Don't Hinder Me: The African American Sacred Song Tradition. University of Nebraska Press. p. 21, citing Joseph "Gospel Joe" Williams. ^ "Charles Henry Pace Gospel Music Collection". University of Pittsburgh. Retrieved September 5, 2015. ^ Robert Palmer. Deep Blues. Penguin Books. p. 110. ISBN 978-0-14-006223-6. ^ Staig, Laurence (1993-01-26). "Obituary: Thomas Dorsey". The Independent. Retrieved 2014-06-14. ^ "Precious Lord and Tommy Dorsey". snopes.com. Retrieved 2014-06-14. ^ "Thomas A. Dorsey". Inductees Archive. Gospel Music Hall of Fame. Retrieved 14 March 2018. Boyer, Horace Clarence (1995), How Sweet the Sound: The Golden Age of Gospel. Elliott and Clark. ISBN 0-252-06877-7. Harris, Michael W. (1992), The Rise of Gospel Blues: The Music of Thomas Andrew Dorsey in the Urban Church. Oxford University Press, ISBN 0-19-506376-7. Heilbut, Anthony (1997). The Gospel Sound: Good News and Bad Times. Limelight Editions. ISBN 0-87910-034-6. Reagon, Bernice Johnson (1992). We'll Understand It Better By and By: Pioneering African-American Gospel Composers. Smithsonian Institution. ISBN 1-56098-166-0. "The Father of the Chicago Gospel Singing Movement", including MP3 links.